This dish takes about five minutes to cook so you have to have everything prepared beforehand. However, it really only takes a couple of minutes getting everything ready so there’s no real hard graft required. It’s however essential that you have a saucepan or wok that has a lid because you’re going to need it! Because it cooks so quickly, I thought I’d put a running order of the frying process so you understand how fast you need to be. I got my husband to time the cooking process because it all happens so quickly. Here’s the cooking timing from the moment the oil becomes hot in your saucepan or wok…keep the heat on high! 0.00 mins: Drop your ginger slices into your hot oil and fry for 45 secs. They’ll start turning golden brown. 0.45 min: Add your sliced garlic and fry for another 30 secs. 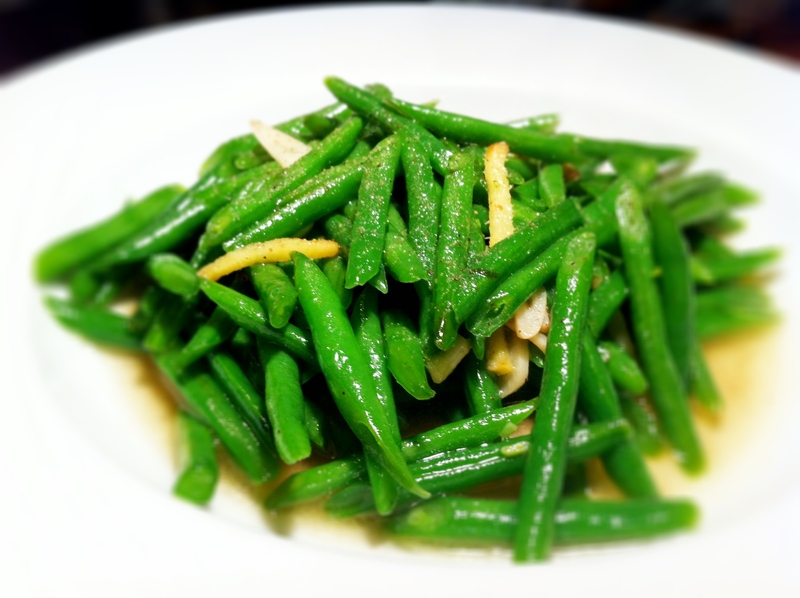 1.15 mins: Add green beans and toss well for 15 secs so they’re all coated in oil (be careful as the oil will splutter!). 1.30 min: Add your seasoned water. Stir well (careful of the spluttering) for 10 secs and pop the lid on. 4.00 mins: Allow your beans to fry, covered, and stir maybe once or twice. if you like your beans crunchy, only fry them for 3-4 minutes. If you like them softer, give them another 30 secs to 1 min. Pour into a dish and sprinkle with white or black pepper.